Pond water colorants are essential once water clarity has been achieved from the use of Healthy Ponds products. 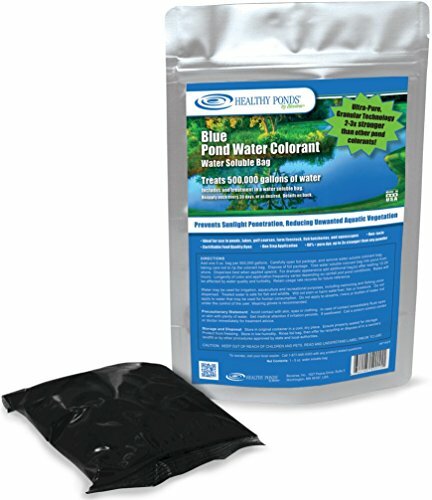 Healthy Ponds Pond Water Colorants will effectively shade the pond and limit sunlight penetration, reducing unwanted weed growth and the development of algae. Safe for fish, plants, pets and humans, Healthy Ponds colorants contain no sulfates or dispersion aids, and are made from the same certified food quality dyes used by famous name-brand candy manufacturers in their brilliantly colored hard-shell candy coatings. Simply toss the water soluble bag into the water from the shore. Within 24 hours of applying the Healthy Ponds Pond Water Colorant, the pond will take on a beautiful appearance that will reflect the sky, and help make your Healthy Ponds AquaSpherePRO more effective. 5-ounce water soluble bag treats up to 500,000 gallons. To calculate pond volume: length x width x depth x 7.5 = total gallons. If you have any questions about this product by Healthy Ponds, contact us by completing and submitting the form below. If you are looking for a specif part number, please include it with your message.